Com­pe­ti­tion is a part of young people’s lives: art, sports, music, dance, sci­ence, cup-stack­ing … many chil­dren spend a good part of their day prac­tic­ing, learn­ing, and striv­ing to do their best. Giant Pump­kin Suite is about two types of com­pe­ti­tions, a Bach Cel­lo Suites Com­pe­ti­tion and a giant pump­kin grow­ing com­pe­ti­tion. Rose and Thomas Bruti­gan are twelve-year-old twins … but their per­son­al­i­ties and inter­ests are quite dif­fer­ent. It’s a book set with­in a neigh­bor­hood that pulls togeth­er when a seri­ous acci­dent changes the tra­jec­to­ry of their sum­mer. We meet so many inter­est­ing peo­ple, chil­dren and adults, in this book. It’s full of hold-your-breath plot turns. The book is writ­ten at a lev­el for 5th to 8th grade read­ers (and adults) and it has many ties to pop­u­lar cul­ture, math­e­mat­ics, gar­den­ing, and the nature of com­pe­ti­tion. It’s an excel­lent choice for a book club dis­cus­sion. In each Book­storm™, we offer a bib­li­og­ra­phy of books that have close ties to the the fea­tured book. You’ll find books, arti­cles, web­sites, and videos for a vari­ety of tastes and inter­ests. You’ll find more infor­ma­tion about Melanie Heuis­er Hill on her web­site. Johann Sebas­t­ian Bach. Rose Bruti­gan focus­es on an upcom­ing Bach Suites Com­pe­ti­tion by prac­tic­ing … a lot. Who was Bach and why is his music still with us 260 years after his death? Resources include books and videos of our best cel­lists play­ing the Bach Cel­lo Suites. The Cel­lo. More about the instru­ment Rose plays, with a num­ber of videos you can share with your class or book club. Charlotte’s Web. This book is a favorite of Rose and her neigh­bor Jane. Charlotte’s Web pro­vides a major turn­ing point in Giant Pump­kin Suite. Learn more about the book and its author, E.B. White. Giant Pump­kins. Thomas and his neigh­bors work togeth­er to grow a giant pump­kin. Today, these pump­kins (not grown for eat­ing) can way over 2,000 pounds—more than one ton. Books, videos, and arti­cles share sto­ries and how-tos for grow­ing giant pump­kins com­pet­i­tive­ly. Japan­ese Tea Cer­e­mo­ny. Mrs. Kiyo shares this beau­ti­ful cer­e­mo­ny with Rose. The Book­storm sug­gests a video for your stu­dents to watch. Math­e­mat­ics and Bach. Are you aware that Bach used math and physics when cre­at­ing his com­po­si­tions? Your stu­dents can delve into this fas­ci­nat­ing aspect of the com­pos­er! Movie Musi­cals. The music from musi­cals of the 1940s and 1950s is very impor­tant to Jane and Mrs. Lukashenko—they sing and tap dance at the least sug­ges­tion. We pro­vide three sug­ges­tions for watch­ing these movies. Music Com­pe­ti­tion (Fic­tion). There are a num­ber of excel­lent books about young peo­ple prepar­ing for, and play­ing in, music com­pe­ti­tions! Music in Mid­dle Grade Books. And more nov­els in which music is an impor­tant part of the plot. Neigh­bor­hood Books. We sug­gest books in which the peo­ple and places of a neigh­bor­hood are inte­gral to the plot of a book. Per­haps you’ll find your favorites. Tap Danc­ing. Who can resist a good tap dance? Anoth­er strong plot point, we sug­gest books and videos to share with your stu­dents. Let us know how you are mak­ing use of this Book­storm™. Share your ideas and any oth­er books you’d add to this Book­storm™. In Under the Egg, Theodo­ra Ten­pen­ny begins her sto­ry when her beloved grand­fa­ther, Jack, is hit by a taxi … and dies. Out­side their 200-year-old Man­hat­tan town­home, Jack whis­pers to Theo to “look under the egg.” Deal­ing with her grief, but des­per­ate because she and her head-in-the-clouds moth­er have no income, Theo tries to fig­ure out what her grand­fa­ther meant. She’s fair­ly cer­tain he’s try­ing to pro­vide for them, but did he have to be so mys­te­ri­ous? What unrav­els is a tense mys­tery of art “theft,” Jack’s sol­dier­ing in World War II, sus­pi­cious adults who become alto­geth­er too inter­est­ed, and a new best friend, Bod­hi, who aids and abets Theo’s hare­brained, but ulti­mate­ly bril­liant, schemes. 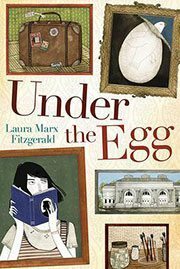 Under the Egg is a fast-paced, intel­li­gent, learn­ing-about-art-his­to­ry while sav­ing the world sort of book, not unlike Indi­ana Jones or Mr. Lemoncello’s Library. I stayed up all night to read it, unable to rest until the mys­tery was solved. On Lau­ra Marx Fitzgerald’s web­site, there are won­der­ful resources. When I fin­ished Dan Brown’s The DaVin­ci Code, the first thing I did was find a paint­ing of The Lord’s Sup­per to see if he was right. Fitzger­ald saves us the hunt. There’s a map of all the places Theo vis­its in New York City. There’s more about Raphael, with thought­ful­ly pro­vid­ed paint­ings that link to fas­ci­nat­ing sto­ries from the painter’s life. There’s a page devot­ed to sep­a­rat­ing fact from fic­tion. And more. Read­ers who love adven­tur­ous romps, who like to puz­zle through a mys­tery, or enjoy vis­it­ing art muse­ums will adore this book.